Overland, judges Alison Whittaker, Nguyễn Tiên Hoàng and Toby Fitch, and the Malcolm Robertson Foundation are thrilled to announce the results of the 2018 Judith Wright Poetry Prize. Overland and the Malcolm Robertson Foundation are very pleased to announce the entries that placed in the 2018 Neilma Sidney Short Story Prize. This year, the first place prize is $4000 and publication in Overland 235. Two runner-up stories will be awarded $500 each, and will be published online alongside our winter edition. We’d like to thank the 650 entrants for their impressive work this year. Now, the 2018 judges – Alison Whittaker, Nguyễn Tiên Hoàng and Toby Fitch – have arrived at a shortlist of nine outstanding poems. From a pool of 863 entries, a longlist of 30 impressive stories, and a very strong shortlist of thirteen, this year’s judges – Michelle Cahill, Sarah Schmidt, Tom Clark and Jennifer Mills – have decided on the 2018 winner and two runners-up in the $8000 Overland Victoria University Short Story Prize for New and Emerging Writers. An initiative of the Queensland Poetry Festival, the Emerging Older Poets’ Mentorship is designed to address a lack of opportunities in the 55+ age bracket. While we’d like to thank all 863 entrants who worked hard to submit this year, the four judges for the 2018 competition – writer Sarah Schmidt, writer and editor Michelle Cahill, writer and VU academic Tom Clark, and writer and Overland fiction editor Jennifer Mills – have now decided on a shortlist of thirteen outstanding stories. Final results of the 2017 Nakata Brophy Prize! The Nakata Brophy Short Fiction and Poetry Prize recognises the talent of young Indigenous writers across Australia. 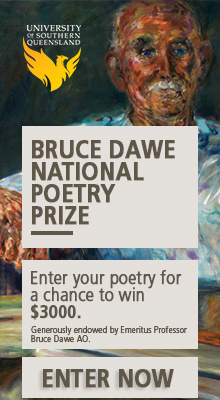 Sponsored by the University of Melbourne’s Trinity College, the prize alternates each year between fiction and poetry; this year’s prize is for the best poem (up to 88 lines) by an Indigenous writer under 30. The final results of the 2017 Overland Neilma Sidney Short Prize. The final results of the 2017 Overland Judith Wright Poetry Prize, as well as notes on the shortlist and a list of Highly Commended poems from this year’s competition. The 2017 judges – Nic Low, Ryan O’Neill and Jennifer Mills – have finished their blind judging and deliberation, and decided on a shortlist of thirteen brilliant stories that approach the theme in original ways. The 2017 judges, poet Ali Cobby Eckermann and Overland poetry editor Toby Fitch, have finished blind judging the competition and, after deliberation, have selected a shortlist of nine poems. Overland, the National Union of Workers, the Media, Entertainment & Arts Alliance, and the National Tertiary Education Union (VIC) are very pleased to announce the winning entries of this year’s Fair Australia Prize. We are pleased to announce the shortlisted writers and artists for the 2017 Fair Australia Prize. Overland, Victoria University and this year’s four judges – Frank Moorhouse, Enza Gandalfo, Ian See and Rachael McGuirk – are very pleased to announce the winners of the Victoria University Short Story Prize for New and Emerging Writers. Overland and Victoria University are pleased to announce that the four judges of this year’s Victoria University Short Story Prize for New and Emerging Writers – author Frank Moorhouse, UQP editor Ian See, writer and academic Enza Gandalfo and Overland’s Rachael McGuirk – have reduced this year’s 800 entries to a shortlist of ten stories. Overland, Trinity College and judges Tara June Winch, Jennifer Mills and Katherine Firth are very pleased to announce the final results of this year’s Nakata Brophy Prize. Now in its fourth year, the Nakata Brophy Short Fiction and Poetry Prize recognises the talent of young Indigenous writers across Australia. Sponsored by the University of Melbourne’s Trinity College, the prize alternates each year between fiction and poetry; this year’s prize is for the best short story (up to 3000 words) by an Indigenous writer under 30. Overland and judges Stephanie Bishop, Aviva Tuffield and Tony Wheeler are pleased to announce the winning entries in this year’s Neilma Sidney Short Story Prize. The three judges for this year’s competition – Stephanie Bishop, Aviva Tuffield and Tony Wheeler – have finished their blind judging and deliberation, and decided on a shortlist of nine outstanding stories with varying approaches to the theme. For the first time in its history, the Overland Judith Wright Poetry Prize has resulted in a tie; as such, the prize money for this year’s first and second place will be combined, and split evenly between the two poems that have placed equal first. The 2016 judges, Overland poetry editor Toby Fitch and poet Jill Jones, have finished blind judging the competition and, after deliberation, have selected a shortlist of nine poems. Overland and the National Union of Workers are very pleased to announce the winning entries of this year’s Fair Australia Prize. We are pleased to announce the winners of the 2016 Overland Story Wine Prize. Overland and the National Union of Workers are pleased to announce and congratulate the following writers and artists who have been shortlisted for the 2016 Fair Australia Prize. We received more than 500 entries in the third year of the Overland Story Wine Prize, the calibre of which greatly impressed our three judges – award-winning writer and screenwriter Michelle Law, novelist and winner of the 2015 Stella Prize Emily Bitto, and winner of the 2015 Overland Story Wine Prize, Melissa Manning. Overland, Victoria University and this year’s three judges – Jennifer Mills, Alison Whan and Jacinda Woodhead – are very pleased to announce the winners of the Victoria University Short Story Prize for New and Emerging Writers. Overland and Victoria University are pleased to announce that the three judges of this year’s Victoria University Short Story Prize for New and Emerging Writers – Overland fiction editor Jennifer Mills, Overland editor Jacinda Woodhead and Victoria University’s Alison Whan – have reduced this year’s 500 entries to a shortlist of fourteen stories. This $20,000 prize encourages artists and writers of fiction, poetry and essays to be part of setting a new agenda for Australia. Winning entries will be published in a special Fair Australia supplement in Overland 225, to be launched in Melbourne in early December. Entry is free. Announcing the winners of this year’s Nakata Brophy Prize for Young Indigenous Writers. The three judges for the 2015 competition – Charmaine Papertalk-Green, Overland’s Toby Fitch and Trinity College’s Katherine Firth – have now decided on a shortlist of six outstanding poems from up-and-coming Indigenous writers. Overland magazine and the Malcolm Robertson Foundation are very pleased to announce the winners of the inaugural Neilma Sidney Short Story Prize. The three judges for the first year of the competition – Alice Pung, Ellen van Neerven and Stephanie Convery – have now finished their blind judging and deliberation, and decided on a shortlist of eight outstanding stories with varying approaches to the theme, ‘travel’. Overland magazine and the Malcolm Robertson Foundation are very pleased to announce the winners of the 2015 Judith Wright Poetry Prize. In its ninth year, the Overland Judith Wright Poetry Prize continues to attract hundreds of outstanding new poetic works from across Australia and New Zealand. Now, Overland’s retiring poetry editor Peter Minter and Overland’s new poetry editor Toby Fitch have finished blind judging the competition and, after deliberation, have selected a shortlist of eight poems. Overland, Victoria University and the three judges – Nam Le, Natalie Kon-yu and Jacinda Woodhead – are very please to announce the winners of the Victoria University Short Story Prize for New and Emerging Writers. Overland and Victoria University are pleased to announce that the three judges of the Victoria University Short Story Prize for New and Emerging Writers – writer Nam Le, writer and Victoria University academic Natalie Kon-yu and Overland editor Jacinda Woodhead – have finally decided on a shortlist of twelve stories. The stories that stood out in this year’s competition, especially those on the shortlist, note judges Alicia Sometimes, Clare Strahan and Leah Swann, honed in on a moment or mood ‘with precision and attention to the finest, evocative detail’. After reading the entries blind, the judges have selected a shortlist of eight outstanding stories. The winning story will receive a $4000 first prize and be published on the label of a bottle of Story Wine, as well as in Overland’s print magazine. Two runners-up will each receive $500 and be published at Overland online, and on the labels of different Story Wines vintages. Winners will be announced next week. Arts Queensland’s XYZ Prize for Innovation in Spoken Word is Australia’s first arts award that recognises the growing field of spoken word. Overland and the National Union of Workers are very pleased to announce the winners of the inaugural Fair Australia Prize, all of whom will be published in Overland 220, a special extended edition to be launched in Melbourne in late August. VU Short Story Prize now open! The Overland Victoria University Short Story Prize for New and Emerging Writers is now open. This year, the competition will be judged by writer Nam Le, writer and academic Natalie Kon-yu and Overland‘s Jacinda Woodhead. Since 2007, the Overland Judith Wright Poetry Prize has been Australia’s richest competition for new and emerging poets. This year again the competition attracted hundreds of high-calibre entries. The judges – Overland editor Jeff Sparrow, fiction editor Jennifer Mills, deputy editor Jacinda Woodhead, and Victoria University academic and writer Jenny Lee – have finally decided on a shortlist of thirteen stories. It’s our great pleasure to announce the winners of the inaugural Overland Story Wine Prize. We received around 400 entries for our inaugural Story Wine Prize. The three judges – novelist and Overland contributing editor Clare Strahan, wine writer and critic Campbell Mattinson, and short story writer and novelist Paddy O’Reilly – said they found the stories to be clever and diverse, and of a high standard overall. The competition aims to discover the finest in original short fiction by new writers across Australia and New Zealand. With a $6000 first prize and two runner-up prizes of $1000, the award is the most lucrative of its kind in both countries. All three winning stories will also be published in Overland magazine. Welcome to the Overland Story Wine Prize. The competition aims to discover the finest in original short fiction under a thousand words. The winning story will receive a $3000 first prize and will be published on the label of a Story Wines shiraz, as well as in Overland. Two runners-up will each receive $500.